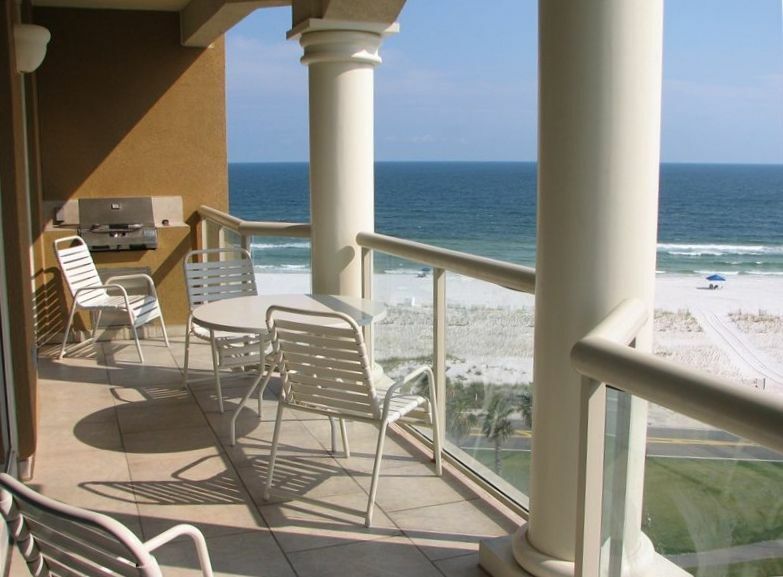 Our Portofino Unit is a Gulf Front Condo with sensational views of the Gulf of Mexico and the Santa Rosa Sound. This unit has 1,333 square foot of living space as well as a large balcony with a convenient outdoor grill. The vista from the patio allows sensational sunsets and beautiful Gulf and Sound views. This condo has many upgrades including tile flooring throughout, granite counter tops in the kitchen and bath, and a fully equipped kitchen for those who like to cook. The master bedroom has a king bed with a great view of the Gulf and Sound. The second bedroom also features outstanding views (all windows are floor to ceiling). This second bedroom has a queen and twin bed to accommodate 3 persons sleeping. All rooms were professionally decorated with a beach theme. Portofino has a 40,000 square foot Lifestyle Center which has outdoor infinity pools and hot tubs, an indoor Olympic size pool, a 3,000 square foot fitness center with steam and sauna, and multiple spa services. Each Portofino tower has its own pool and hot tub Our unit overlooks the pool. Enjoy on site dining at Portofino's Terra Cotta Restaurant, wine bar, gourmet deli, and juice bar. Portofino is a true resort, and a destination your family will want to return to year after year. Portofino has a 40,000 square foot lifestyle center available to guests who stay at this resort. Easy to book, owner was great through the entire process and very accommodating. Highly recommend. We had a great time, Kathy our host was great, she was very helpful and accommodating she went above and beyond for us. The condo was everything we hoped it would be and we had a great time, we will be staying with Kathy again and probably real soon. I will recommend this condo and any other Kathy is managing. We can't thank her enough for the wonderful time and memories that were made. Portofino is an amazing place. The best part of this rental is the view! Our patio was amazing and the view from our bedroom was wonderful! The beach and other property amenities were easily accessible. Kathy was a delight to work with. She was very responsive and accommodating. As far as the room itself, the floor plan and layout is perfect! We love to cook and the kitchen had most things we needed. The oven buttons did not work so we were not able to change the temperature of the oven. The washer and dryer were quite outdated and rusted, but seem to work fine. The safe in the master bedroom was inoperable. The pullout sofa bed was quite uncomfortable (even as couch beds go). The unit was overall not clean and would have been nice to have had access to cleaning materials. The cleaning charge is standard but did not seem to cleaned well prior to our arrival. Overall, we loved the unit and hope to definitely return to Portofino and rent from Kathy again. LOVED THE VIEW! Portofina was beautiful. It was well furnished and stocked. Our group had a wonderful time at The Portofino Resort. We would most definitely stay there again. The outside sliding doors are really hard to open but this is probably a good thing if you have small children. Other than that, It could probably use a really good spring cleaning. This was our 6th year at Portofino and Kathy's condo was perfect. The views were amazing from the 8th floor condo. Tower 1 is close to the fitness center and sound side as well as an easy walk to the gulf (beach). We can't wait until next summer!